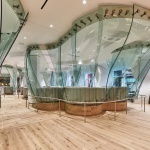 The first photos have been released of the renovated cafeteria at 4 Times Square, originally designed by Frank Gehry for Condé Nast, and the redesign appears to have thoroughly modernized the space. 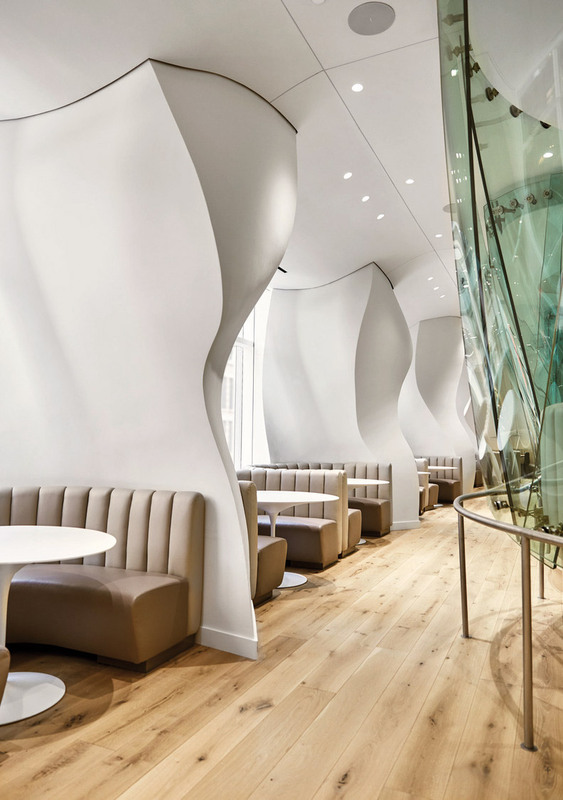 The 260-seat cafeteria, the Los Angeles-based architect’s first project in New York City, was intended to be an exclusive gathering place for Condé Nast employees. 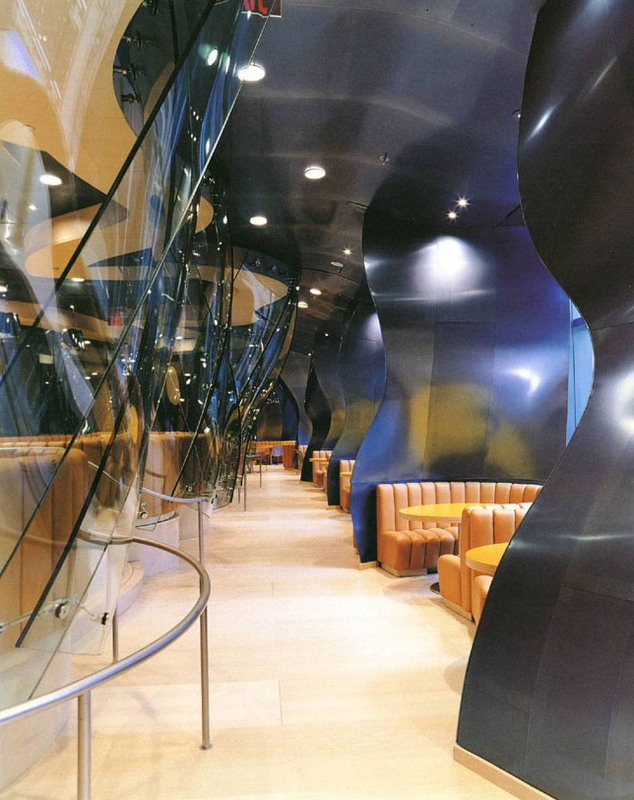 Completed in 2000, Gehry’s curves are prominently displayed throughout the room, from the 12-foot-tall, 4-foot-wide billowing glass partitions hung from the ceiling to the twisting grey titanium columns at the edge of the cafeteria. 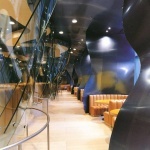 Even the seating reflected the overall design ethos, as rows of orange leather seating undulated alongside the partitions and handrails. 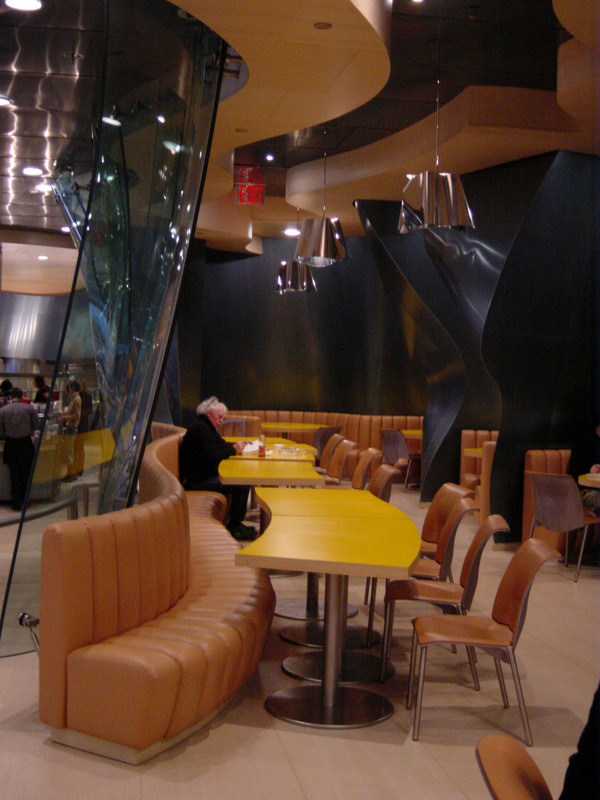 With Condé Nast’s exit from the Durst Organization-owned 4 Times Square in 2015, questions swirled over the ultimate fate of the cafeteria. Now, the Durst Organization has announced that the cafeteria will be the centerpiece of a 45,600-square-foot amenity floor accessible to all of the building’s tenants. 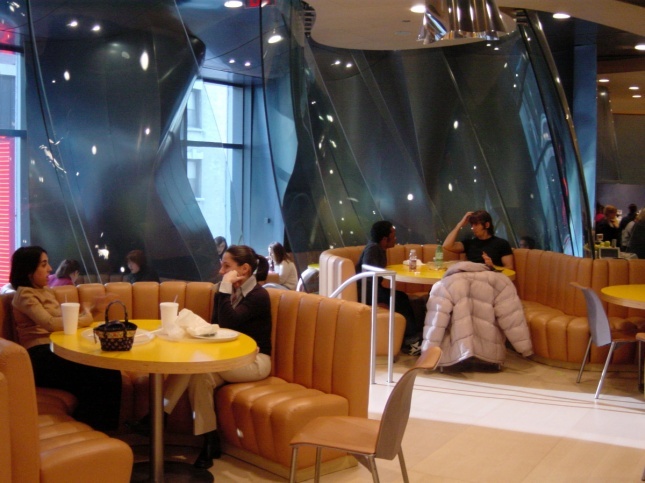 The entire floor’s renovation was handled by local firm STUDIOS Architecture, and the end result is a total transformation of Gehry’s cafeteria that still keeps the fundamental curves in place. The titanium paneling on the walls and ceiling have been painted white, the floors and accents have been replaced with American white oak planks, and the chrome pendant lights have been stripped out. The bright seating has been reupholstered in hues of beige, and the yellow-topped tables have been replaced with white alternatives. The end result is more IAC Building than Disney Concert Hall, and STUDIOS has definitely succeeded in bringing more light into the space. 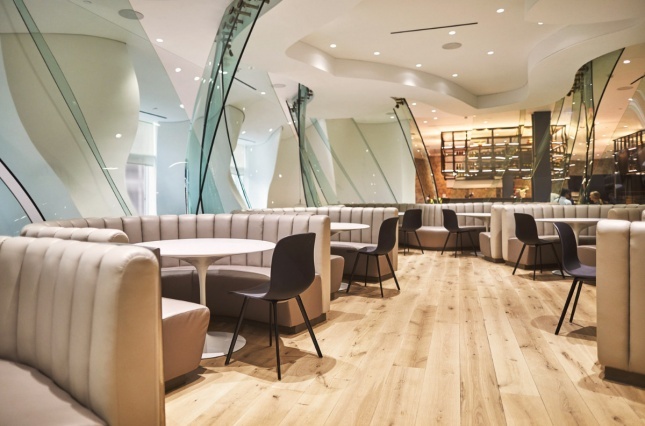 The redesign marks the launch of the Durst Organization’s Well& amenity brand across all of their properties, with this floor at 4 Times Square as their first location. 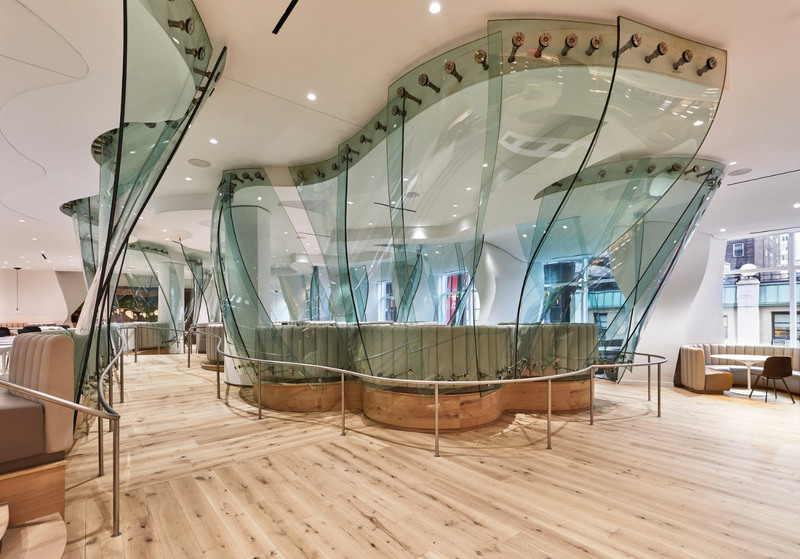 Accessible from the cafeteria is the new “Garden Room,” a circular bar area that features a 106-foot-long, floor-to-ceiling wraparound green wall designed by Blondie’s Treehouse. The southern side of the floor has been leased to Convene, a flexible meeting and workspace management company. 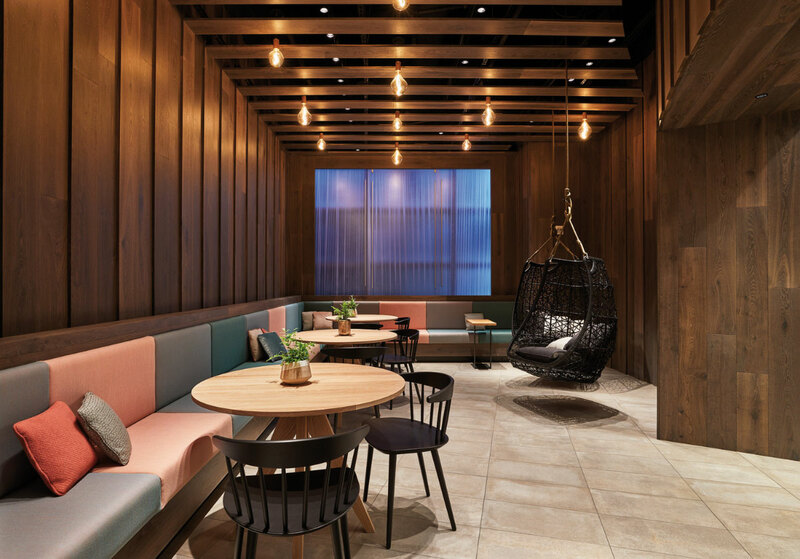 The meeting and event spaces on the Convene side can hold up to 480 people, and the look, handled by their in-house design team, skews towards darker wood paneling and tile flooring. 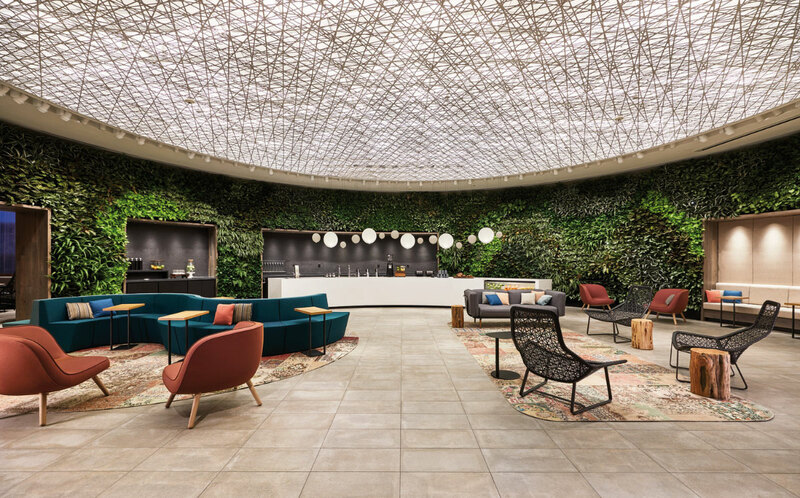 The $35 million renovation of the amenity floor is just one part of Durst’s recent $135 million modernization effort at 4 Times Square, which includes new entrances, elevator cabs, and a full lobby and reception renewal.